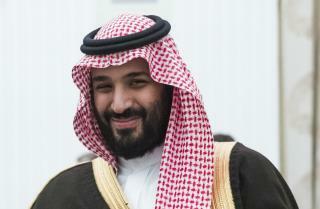 (Newser) – Tensions between Saudi Arabia and Iran are creeping ever higher, with the Saudi crown prince referring to Iran's supreme leader as "the new Hitler" in an interview with the New York Times. Mohammed bin Salman also suggested Ayatollah Ali Khamenei's influence in the Middle East needed to be curtailed. "We learned from Europe that appeasement doesn't work," he said. "We don't want the new Hitler in Iran to repeat what happened in Europe in the Middle East," added Salman, who recently waged what he refers to as an anti-corruption campaign, though others say it's a move to consolidate power. Hitler has been turned into a cartoon villain, this is the reason why he is so often used in political conflicts. Someone else is noticing: I THOUGHT this guy was killed in a Helo crash! What's up w/that! The news lies so much! That's why I get my NEWS, from the "GOOD NEWS" a King James Bible! Says the dictator who invaded Yemen, where millions of people are now dying of cholera.